A straightforward and remarkably easy slots experience, “Super Slalom” slots by PlayTech offers three lines of wagering across a standard three reel, single payline gaming experience. The ski theme is emphasized by a jackpot symbol of a trophy, and by sound effects that match the atmosphere of a downhill skiing experience. The other symbols that fill the reels include traditional cherries and multi-colored “bars” and these make it easy to instantly read a winning spin from a non-winner. With coin amounts from five cents to five dollars available across all three reels, the ultimate jackpot of five thousand coins can be a real “champion” winning experience for a bold or daring player. #1 Bovada Casino up to $3000 Play Now! #2 Slots.lv Casino up to $5,000 Play Now! #3 SlotoCash Casino up to $7,777 Play Now! #4 Lincoln Casino up to $5,000 Play Now! #5 Planet 7 Casino up to $1,000 Play Now! While “Super Slalom” slots doesn’t have any wild symbols or bonus features it does give all players the benefit of an instant win anytime the cherry symbol or icon makes an appearance across the payline. Any two matching symbols appearing along with the cherry icon yield bigger rewards. “Super Slalom” also rewards players with an “any 3” combination, yielding coins for any three bar symbols appearing along the payline. This means that a single, double or triple bar combination of any kind can yield a player from ten to thirty coins! 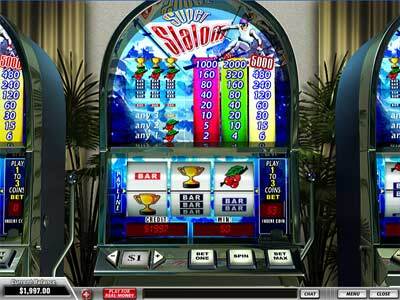 Such easy gaming as that offered by “Super Slalom” does not require additional bonus or free spin features. The instant winning cherries symbol, coupled with the “any 3” feature brings satisfaction to most experienced and beginner slots players. The flexibility of wager amounts also creates enough excitement and focus to eliminate the need for further distractions and offers pure slots fun. Most traditional three reel, single payline slots games do not offer bonus rounds or free spins. The benefits to players of “Super Slalom” are that they do have the opportunity to receive a winning combination from a single appearance of a symbol. Payouts for “Super Slalom” are extremely generous and uncomplicated. A single cherry along the payline yields from two to six coins depending upon the number of coins wagered on the spin. Any two matching symbols with the cherry icon deliver from five to fifteen coins. The “any 3” symbols reveal brings a ten to thirty coin reward. Three red bars is a twenty to sixty coin payoff, while three double bars wins forty to one hundred and twenty coins, and the triple bar spin brings eighty to two hundred and forty coins. Three cherries across the payline is a wining of one hundred and sixty to four hundred and eighty coins, while the biggest rewards are won from the trophy symbol (of course) which can bring from one to five thousand coins. When you consider that the maximum bet is a $15 dollar wager then any of the rewards have the potential to bring an incredible return. As easy to use as it is fun to play, “Super Slalom” will appeal to slot machine purists and newcomers alike. Offering great rewards along numerous lines of play, nice additions to traditional spin combinations, clear and concise graphics and flexibility for both the bolder or less bold players.